It’s true. British archaeologists have scoured the globe and brought back roughly 8 million beautiful and important artifacts from civilizations worldwide. Is it ethical? We think it depends. On one hand, it seems a shame to rob countries of their history. On the other hand, we’ve seen museums in developing or unstable countries (e.g. Egypt and Cuba) store uncurated collections of important artifacts in non-climate-controlled rooms, direct sunlight, or even outdoors. 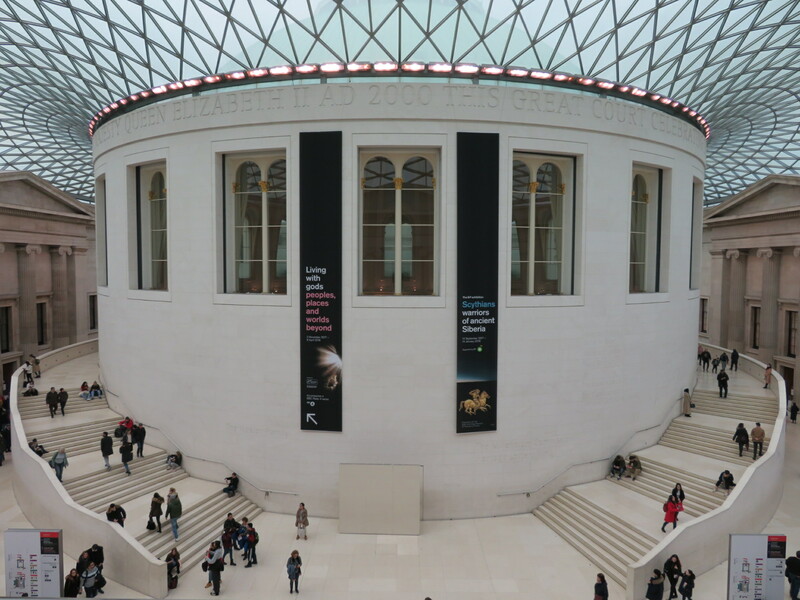 In that case, the British Museum’s impeccable preservation and curation doesn’t sound so bad. 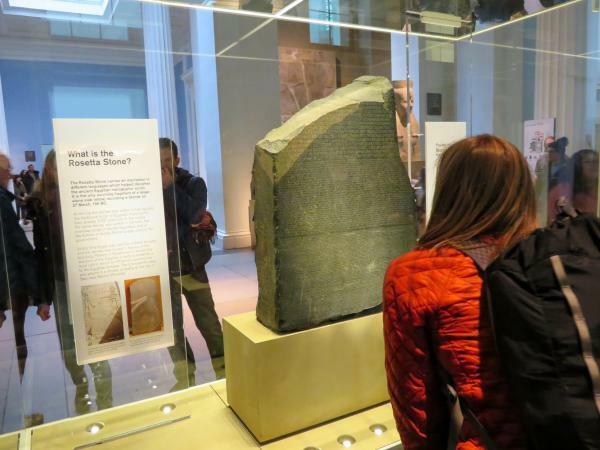 We were unable to see all of the museum in an afternoon, as you can imagine, but we did make a point to hit the museum Director’s top highlights, including the Rosetta Stone. The Rosetta Stone was discovered in mid-July 1799 by soldiers in Napoleon’s invading army at the town of Rashid (Rosetta), and later surrendered to the British as part of the Treaty of Alexandria in 1801. Copies of it were circulated internationally and within 25 years, the hieroglyphic script was deciphered. 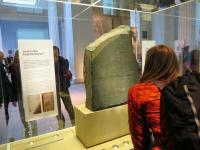 I had been dreaming of seeing this stone since the 6th grade. The Royal Game of Ur, 2600-2300 BC, modern day Iraq. At least six graves in the Royal Cemetery contained a wooden game board inlaid with shell, red limestone and lapis lazuli for the game now known as the Royal Game of Ur. 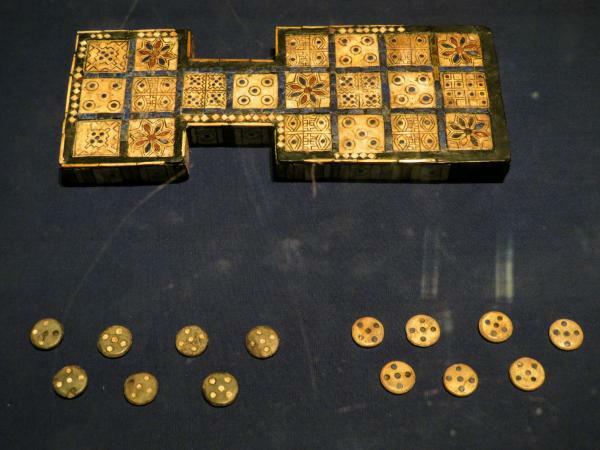 This is an early example of a game that was played all over the ancient Near East for about 3000 years. (Museum description). Pair of gold armlets, 5th-4th century BC, Oxus Treasure. These objects are among the most important surviving items of ancient Persian craftsmanship. It is likely that they were intended for display rather than being worn. The lion-griffin terminals were originally inlaid with precious stones, which were later removed. This inlay is typical of high-quality jewllery from this period. 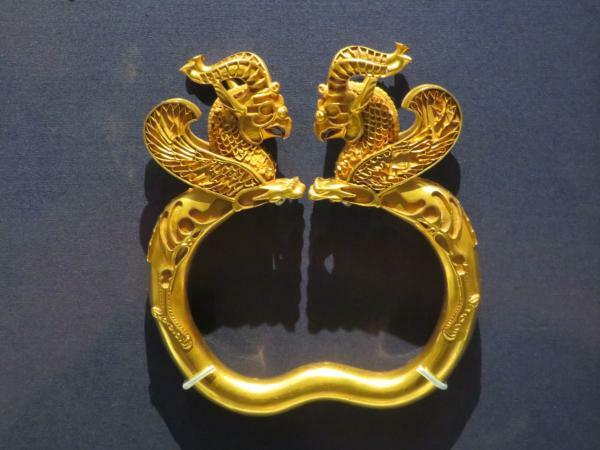 Similar armlets are shown on the sculptures at Persepolis, presented as royal gifts by the Lydian delegation. (Museum description). Palace of Sargon. 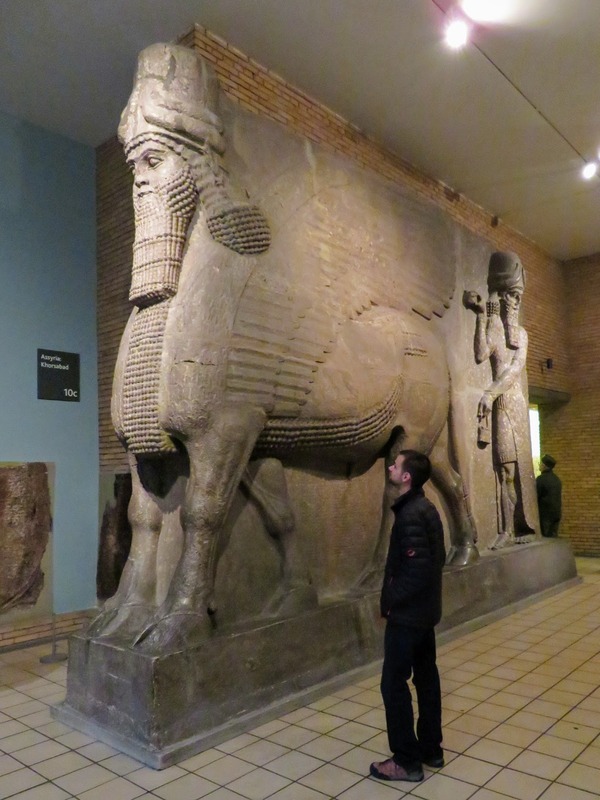 These are sculptures from the city and palace of Korsabad, built for the Assyrian king Sargon II (721-705 BC). The pair of human-headed winged bulls stood originally at one of the gates of the citadel, as magic guardians against misfortune. (Museum description). 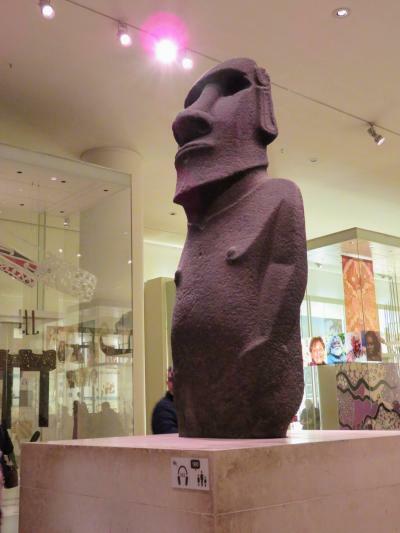 Basalt statue known as Hoa Hakananai’a (Probably ‘Stolen or hidden friend’), Easter Island, Chile, 1000-1200 AD. This Statue, representing an ancestral figure, was possibly first displayed in the open air. It was later moved into a stone house at Orongo, the center of a birdman cult. Low-relief designs carved on the back are associated with this cult. The statue seems to have been used in both context to express ideas about leadership and authority. 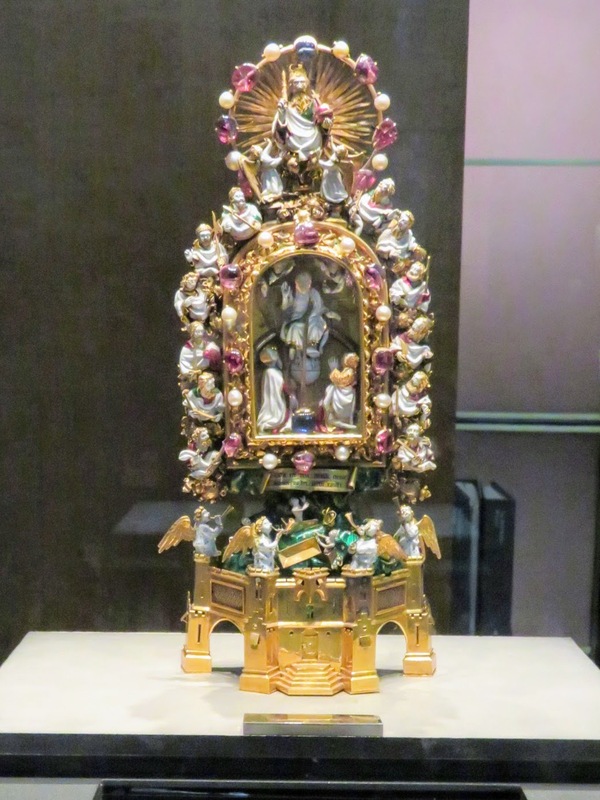 The Holy Thorn Reliquary. Enamelled gold, sapphires, rubies, and pearls. Paris, ~1400. This reliquary was made to contain a thorn, supposedly from the Crown of Thorns that was placed on Christ’s head before the Crucifixion. The armorial enamelled plaques in the base show that it was made for Jean. duc de Berry (1340-1416. The Crown of Thorns itself was a French royal relic, housed in its own chapel in Paris. Individual thorns were detached to make precious reliquary jewels. 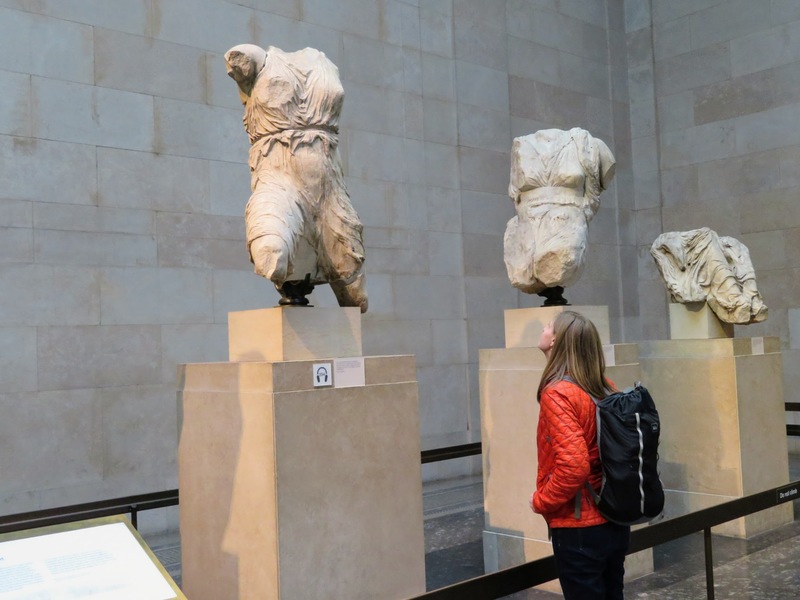 The British Museum houses a collection of statues taken from the Parthenon in Athens, which was built 2,500 years ago as a temple dedicated to the Greek goddess Athena. There is a bit of controversy surrounding these statues. Mainly, Greece would like them back. The heads of many statues live in Athens, while the bodies are in London, and it does seem a shame that they can’t work together to unite them once again. 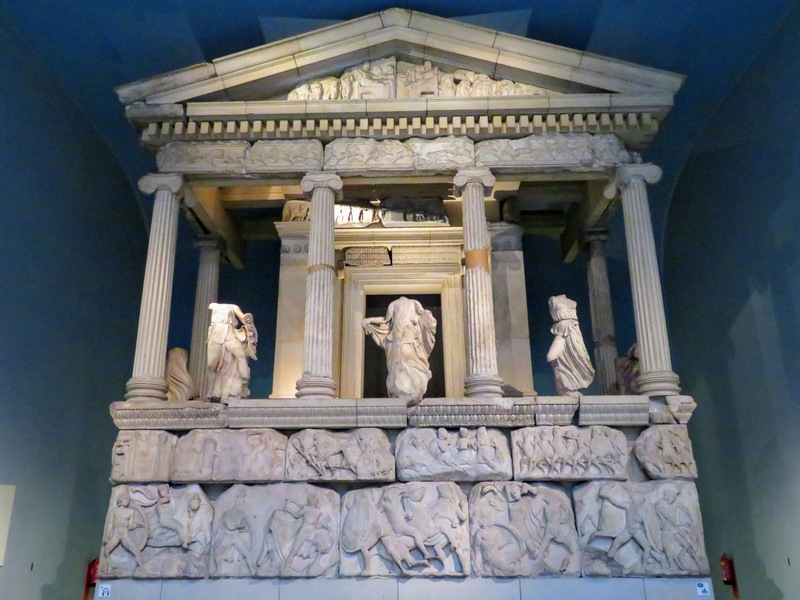 The Nereid Monument. Built by Lykians, a civilization living in modern-day Turkey which was eventually assimilated into Persian and then the Athenian empire. This is the finest and largest example of a Lykian tomb found at Xanthos, southwest Turkey. It is named after the figures of Nereids, daughters of the sea-god Nereus, placed between the columns. It reflects both Greek and Persian influences on Lykian culture. The high podium burial style was Persian, while the architecture is clearly Greek.